Enough with the peanut butter! It’s time to get things a little more coconut up in here. Yeah, there’s some cherry in there too. Of course. And wherever there’s cherry, chocolate is not far behind. I’m getting so predictable in my old age. Let’s rewind a minute. These cherry coconut macaroons started out their short life as a completely different idea for chocolate and coconut flavoured French macarons. Yep, the super tricky, incredibly finicky delicacies from across the channel. But, I just couldn’t get them right. I tried a couple batches using the French method, and then I even tried the Italian method. But alas, it wasn’t to be. They tasted amazing, but they just looked like a five year old made them. 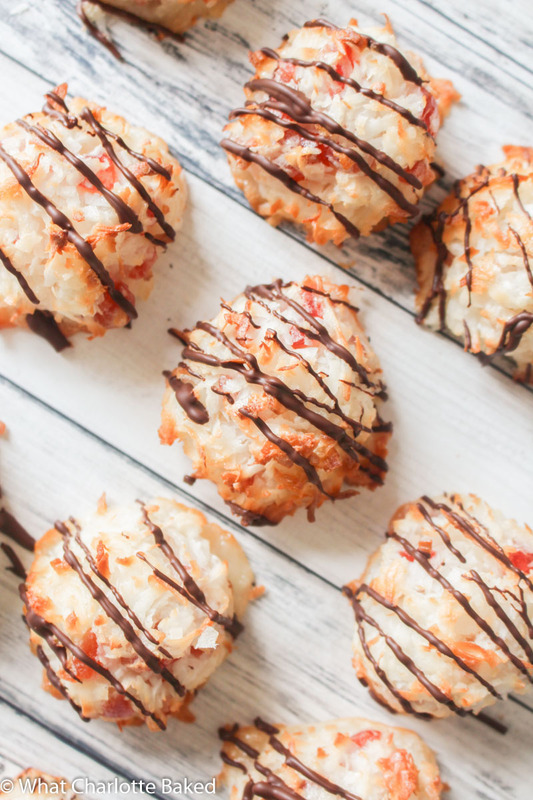 Instead, I decided to bust out this recipe for my second favourite macaroon – the coconut one. Sweet and soft in the middle, with glace cherry pieces, and drizzled with some dark chocolate to finish things off nicely. These guys, unlike their French cousins, are incredibly easy to make. If you can whip egg whites to stiff peaks, you’ve got this one in the bag. 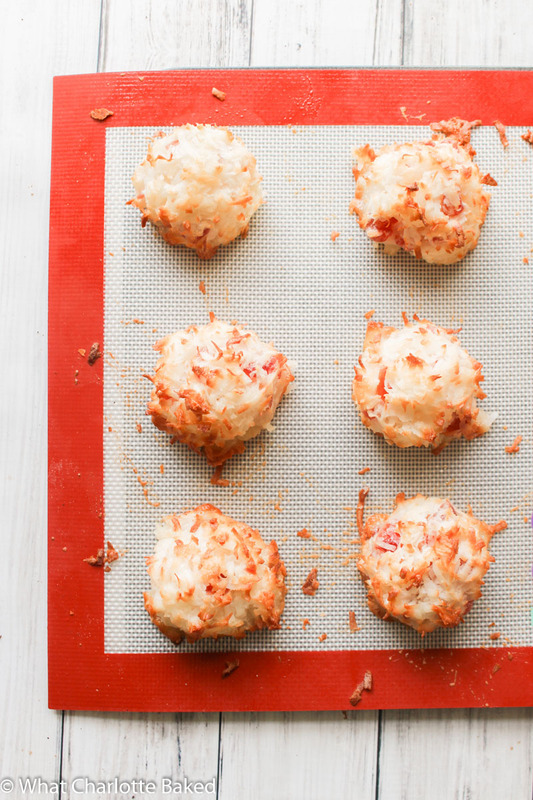 If you’re British you are going to have one little hurdle to get over in order to make the perfect macaroon, and that’s getting hold of some shredded coconut. But Charlotte, can’t I just use that desiccated coconut they sell in every UK supermarket? Well, no. That stuff is too dry, and doesn’t really pack the same coconut punch as the US equivalent. Luckily for you, you can get hold of some on Amazon (yes, it is a little pricey), and I would definitely advise you do to get the proper soft sweet macaroon experience that you’re longing for. But how do you go about actually making these little balls of joy? Well, first up you need to whip the aforementioned egg whites into stiff peaks, with a little sugar and some cream of tartar. Why the cream of tartar? Well, it’s not a 100% necessity here, but I always find that it makes my egg whites whip up that little bit easier. It’s pretty much compulsory when making meringues though. No one wants a flat meringue ? Once you’ve got the egg whites nice and stiff, you’re going to add some flavourings (vanilla and almond extracts), a bit of salt, some chopped glace cherries, and a whole heap of shredded coconut. Fold it together gently to avoid losing all that lovely air you spent so long whipping in, and then scoop up into golf-ball sized mounds and bake for 20 minutes. I used my hands to make the balls, but you can use an ice cream scoop if you don’t want to get your hands dirty. They’ll be ready after about 20-25 minutes, and unfortunately there isn’t a super simple test to check whether they are ready or not. You’re looking for the sticking out bits of coconut to be a golden brown, but if you were to break one apart, the insides would still be squishy and white. I actually made these cherry coconut macaroons a couple of months ago, so unfortunately I haven’t been able to tuck into one whilst writing this post, which is something I always love to do if possible. But, two months on, I can still remember how soft and absolutely delicious these little cookies were. I’ll have to make some more for Christmas – maybe with added cranberries and pistachio? Yep, Christmas is coming. I’ve begun my Christmas shopping, and my notebook is absolutely crammed full of baking ideas to share with you all. Bring. It. On. 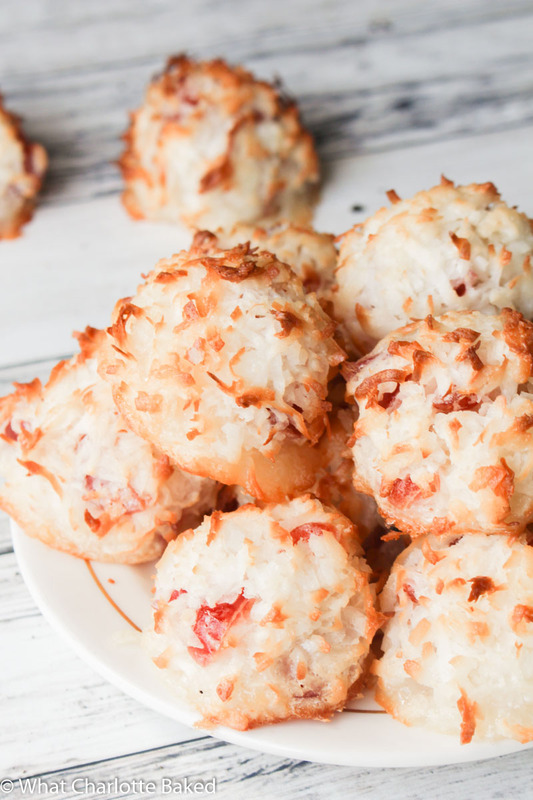 Super sweet, moist, and full of cherries, these coconut macaroons are perfect all year round. Drizzle with dark chocolate for the tastiest treat around. Preheat the oven to 170°C / 340°F (150°C fan) and line a large baking sheet with greaseproof paper or baking parchment. Place the egg whites and cream of tartar into the bowl of your stand mixer (or a large bowl) and whisk using the balloon attachment (or an electric hand whisk) until soft peaks have formed. Add the sugar, and continue to whisk until stiff peaks are formed, and the mixture is nice and shiny. Add the vanilla, almond, salt, coconut, and chopped cherries, and gently fold together until the coconut is completely covered in the egg whites, and the cherries are well distributed. Using your hands (or an ice cream scoop) form golf-ball sized balls of the mixture, making sure they are nice and compact. Place on the lined baking sheet - they won't spread too much in the oven, so they can be fairly close to each other. Pop in the preheated oven for 20-25 minutes. The more exposed bits of coconut should be a nice golden brown, but there will still be some white in there too. Leave to cool completely on the baking sheet. Once cooled, drizzle with melted chocolate and pop in the fridge to set. 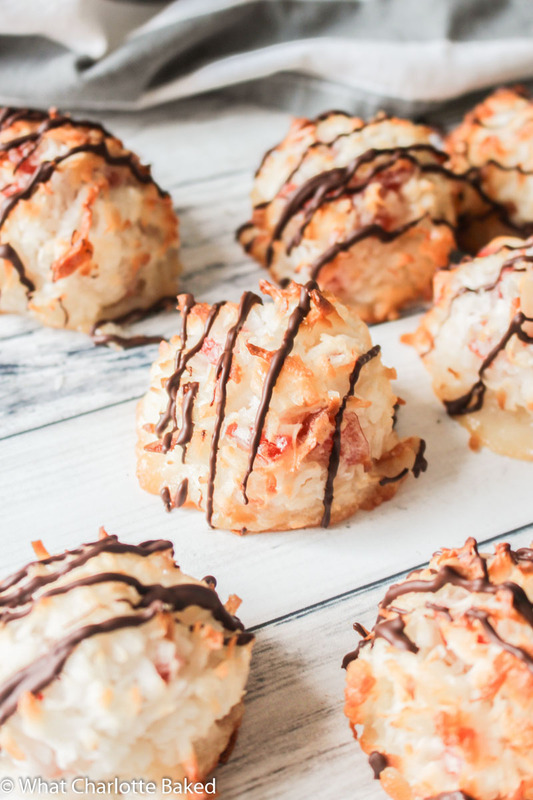 The coconut macaroons will stay fresh for 4-5 days if stored in an airtight container in the fridge. They can also be stored outside the fridge, but may only last 2-3 days. They can also be frozen for up to 3 months - defrost in the fridge overnight, and then store as if freshly made. These were really delicious, I think it had to be shredded coconut as they were so soft!